Ribena (/raɪˈbiːnə/ ry-BEE-nə) is an English origin brand of blackcurrant-based uncarbonated and carbonated soft drink and fruit drink concentrate that until 2013 was produced by GlaxoSmithKline (GSK). The brand originally had a strong reputation as a healthy product for children, stemming from its distribution to children as a vitamin C supplement during World War II by the British government. Beecham (a company that has been part of GSK since 2000) bought the brand in 1955 and developed many soft drink versions. A series of scandals in the 2000s, concerning vitamin C levels, sugar levels, and the amounts of actual fruit in some of the brands, damaged its reputation as a healthy product. By 2013 the brand was widely seen as being similar to other soft drinks. In 2013 annual worldwide sales were around £500 million. That year, GSK sold Ribena and another consumer line, Lucozade, to the Japanese multinational Suntory for £1.35 billion. Ribena was originally manufactured by the Bristol-based food and drink company HW Carter as a blackcurrant squash. :132–133 Development research into pure fruit syrups for the manufacture of milkshakes had been done at the Long Ashton Agriculture and Horticulture Research Station in North Somerset using a pectinase enzyme process; Ribena was essentially invented there by Vernon Charley, a scientist at the University of Bristol in 1933. The blackcurrant variety was found to contain high levels of vitamin C. The drink was launched in 1938 under the name Ribena (from the botanical name for the blackcurrant, Ribes nigrum). During the Second World War, other fruits rich in vitamin C, like oranges, became almost impossible to obtain in the United Kingdom, due to the U boat campaign. Blackcurrant cultivation was encouraged by the Government, and the yield of the nation's crop increased significantly. From 1942, almost the entire British blackcurrant crop was made into blackcurrant syrup (or cordial), almost all of it manufactured by Carters, and distributed to the nation's children for free without the Ribena brand name, giving rise to the lasting popularity of blackcurrant flavourings in Britain. Production moved to the new Royal Forest Factory at Coleford in the Forest of Dean in the autumn of 1947, where production takes place today. Carters was bought out by the Beecham Group (now part of GlaxoSmithKline (GSK)) in 1955. Through the years GSK developed many soft drink versions of Ribena but it retained an image as an "iconic 'healthy food'" in the UK and other commonwealth countries. 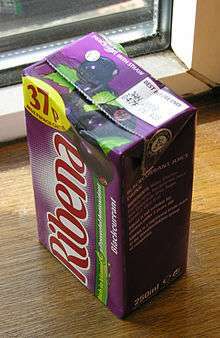 In 2001, a formulation of the diluted Ribena cordial, sold as Ribena Toothkind (and endorsed by the British Dental Association as being less damaging to teeth than other soft drinks), was judged by the United Kingdom Advertising Standards Authority to have been advertised in a misleading manner, and claims that the drink did not encourage tooth decay should be removed from the packaging. The opinion was upheld by a hearing in the High Court. In 2003, The Food Commission in the United Kingdom criticised the sugar levels in regular Ribena as contributing to childhood obesity. In 2004, two high school students in New Zealand, conducted a science experiment to determine the vitamin C levels of their favourite fruit drinks. They discovered that the "Ready to Drink Ribena" product they tested had undetectable levels of vitamin C, counter to the brand's reputation and to advertisements which said that "the blackcurrants in Ribena contain four times the vitamin C of oranges". They contacted GSK, which did not speak with them, and their story was picked up by the television consumer affairs show Fair Go, which broadcast the story nationwide in October 2004. Following further testing, in March 2007, the New Zealand Commerce Commission brought 15 charges in the Auckland District Court against GlaxoSmithKline under the Fair Trading Act. In March 2007, GSK pleaded guilty to all 15 charges and was fined NZ$217,500 by Auckland District Court for misleading consumers, and were ordered to run a series of corrective advertisements and place a statement on its website. GSK maintained the issue only affects Australia and New Zealand, and Ribena sold in other markets, such as the United Kingdom, contain the levels of vitamin C stated on the product label. In 2007, a study conducted by the Australian Consumers' Association for Choice magazine in January 2007 revealed blackcurrant juice (from concentrate) only constituted 5% of the Ribena Fruit Drink product. By 2013, the brand had annual worldwide sales of about £500 million, and was considered to be similar to other soft drinks. and GSK put Ribena, along with Lucozade, up for sale. The eventual sale, announced in September, was for £1.35 billion. Ribena has sponsored a few theme park attractions. These include Berry Bouncers at Chessington World of Adventures, Rumba Rapids at Thorpe Park and Berry Bish Bash at Alton Towers. The contract ended in 2007 and all Ribena logos were removed from the attractions. Tango - similarly bought by Beecham in 1950s but sold in 1986. 1 2 3 4 "We have Frank and Vernon to thank for Ribena". The Bristol Post. 17 September 2013. .
↑ Philip R. Ashurst (2013). Production and Packaging of Non-Carbonated Fruit Juices and Fruit Beverages. Springer Science & Business Media. ISBN 9781475762969. .
↑ "Bristol Scientist creates Ribena". Bristol: University of Bristol. 27 March 2007. Retrieved 4 September 2011. ↑ "Brand Profile: Ribena". Retrieved 2011-07-05. ↑ "Old Photos of Coleford and district — H W Carter". Sungreen.co.uk. Retrieved 2009-08-31. 1 2 3 Tony Jaques (2008). "Pre-publication draft: When an Icon Stumbles – The Ribena Issue Mismanaged" (PDF). Corporate Communications: An International Journal. 13(4): pp 394–406. CS1 maint: Extra text (link). ↑ "HEALTH | Court rules against Ribena". BBC News. 2001-01-17. Retrieved 2009-08-31. ↑ "Ribena, Glaxo and me". The Ecologist magazine. 1 November 2003. ↑ "Soft drinks or liquid candy?". The Food Commission. 29 January 2004. ↑ "Schoolgirls study nabs food giant". New Zealand Herald. March 2007. ↑ "Ribena maker fined $192,000". The Age. March 2007. ↑ Vasagar, Jeevan (27 March 2007). "Schoolgirls rumble Ribena vitamin claims". London: The Guardian. Retrieved 22 May 2010. ↑ Rupert Neate (24 April 2013). "Lucozade and Ribena up for sale". theguardian.com. .
↑ Angela Monaghan (9 September 2013). "Ribena and Lucozade sold to Japanese drinks giant". theguardian.com. .